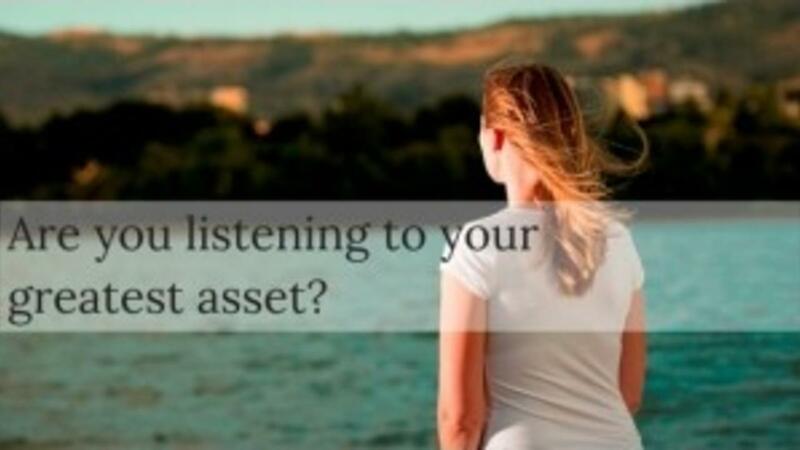 Are You Listening To Your Greatest Asset? It was a few years ago when I was hit smack in the side of the head with the realization that I couldn’t hear myself. I didn’t know what I thought, what I wanted, or what I needed. I had let other’s thoughts and opinion, desires, and needs outweigh my own. It was sad but true; I had completely lost touch with and silenced my inner voice and my business was struggling. In order to start to hear and then to listen to our inner voice, we need to make some changes. It's a process and it’s something we can do every day so we don't find ourselves without access to this invaluable guidance. Here's my process for you to try. The fact is that you, and ONLY YOU, know what is best for you. We often lose sight of this and turn to others to tell us what is best for us, what they think we should do, if what we believe is ok, and if they agree with what we want. If you are in a state, like I was, of looking outside yourself for guidance, you may start to feel resentful and controlled. It’s ok to ask for advice, but ensure that you are giving yourself the room and the time to get clear about what you think and need. You can do this by getting still and quiet. Find a quiet place where you can just be still. Give yourself time to quiet your mind. It’s essential to get out of your head and move into your body. Take a breath in and allow it to move through your body. As you continue to breathe pay attention to what is going on in your body. What feelings are coming up? What sensations are you having? Once you have relaxed and your mind has slowed down, ask yourself the question that you are contemplating. Now listen for the answers. They will come. Instincts are your inner voice speaking to you. They sound like “hmm.” They feel like the hair that stands up on the back of your neck or the gut feeling you get when you just know. They are the red flags you see but too often ignore. You don’t need to intellectually understand. You need to get out of your head, start listening to your instincts and start to trust them. Stop silencing them. They are how you speak to yourself and often you can’t explain why. You don’t need to explain why. Now that you can hear your inner voice again, it is time to start to take those masks off and to show up authentically as you. Let everything that you are wholeheartedly shine brightly: all of your strengths, quirks, uniqueness, beliefs, and fears. It is now time to show up as you and speak your truth- even if your voice shakes. It is a lot less exhausting then pretending to be someone you aren’t while silencing your inner voice. This will push you out of your comfort zone, but in the end, you will feel amazing because you are being true to yourself. I invite you to begin to implement this process into your life and watch as your inner voice begins to show you exactly what you need in your life and business. Want to get regular inspiration for having a soul inspired business? Just click here to sign up to receive regular inspiration. Join our mailing list to receive the latest news and inspirational updates from our team. © 2019 Cheryl Paige Group Inc.